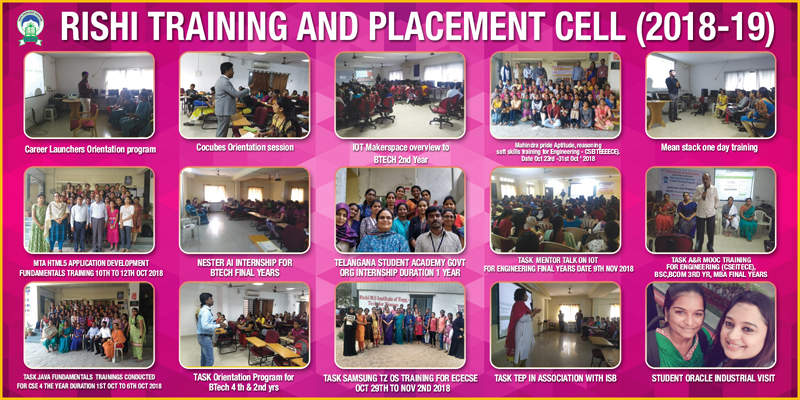 The college has established a Training and Placement Cell. Counseling and guiding of students, providing job market information and necessary inputs to face the interview and written tests. Training on soft skills and technical competency commences make the students industry ready when they graduate. On or Off Campus Placements are conducted to provide suitable career opportunities to the students. In order to achieve this, the database of all the students of different branches is compiled and furnished to identified industries from time to time. No. of students have been placed in all leading Software & IT industries. A good number of students pursue higher studies at India and abroad. * Interaction between industry and institute. * Campus Recruitment Training to students. * Arranging Campus Interviews to students. * Guest lecturers by eminent industry experts. * Faculty training in the industry. * Counseling and Personality Development. * Conducting Mock Interviews and Group Discussions. * To make RITW the favorite destination for all multinational companies. * To establish state of the art in house training facility for honing the skills of the students. * To build RITW brand value in the corporate world. * Plan more industry-institution interactions to benefit students and faculty. * Establishing exclusive Life Skill Lab for soft skills & technical skills. * Strive towards 100% placements. * Introducing video conferencing with industry experts & successful alumni to create awareness for Campus to Corporate Transformation. * Introducing biometric attendance for monitoring attendance for each placement. * Broad basing the existing list of companies. * Scheduling training programs from 1st year to prepare students to cater corporate needs & requirements. * To arrange training for the students in soft skills. For this we have allotted 2 hours per week for each section from second year onwards to cover communication skills and Analytical Skills. * To arrange Expert Lectures from outside institutions to train on Employability Skills. * Arrange workshops on GD and Interview Skills. * Interact with various Industries and establish MOU’s for Recruitment Drives and also for conducting Seminars to make the students aware of the Latest Trends in various areas. * To arrange before each recruitment drive a company/specific training session to make the students concentrate on the specific skills required for that Industry. * After completion of each recruitment drive, a feedback session for all the students so as to analyze and make the students aware of the reasons for not getting selected. * The Institute for Electronic Governance(IEG) is a non- profit organization created by Sate Government, to offer solutions in the discourse of human resources by bringing synergy among the institutions of the government, industry and academia. The main objective is to offer quality human resource and services to IT and ITES sectors. * Career Awareness/ Planning Workshops. * Excellent training for 2-3 years. * Training Practice on employable skills. * Co- curricular activities to enhance Communication and Soft skills. * Campus Placement with Major MNCs. A Cisco Academy is an institution that teaches students necessary networking principles and skills using the Cisco Networking Academy curriculum and tools, in an effort to improve their career and economic opportunities.